5-day Tanzania safari is the best wildlife safari tour. This is fully-guided wildlife safari which allows you to immerse in the beautiful scenery, breathtaking nature, and wildlife. If you are looking to fulfill your outdoor, nature, wildlife and adventure desires then our 5-day Tanzania safari package is perfect for you. 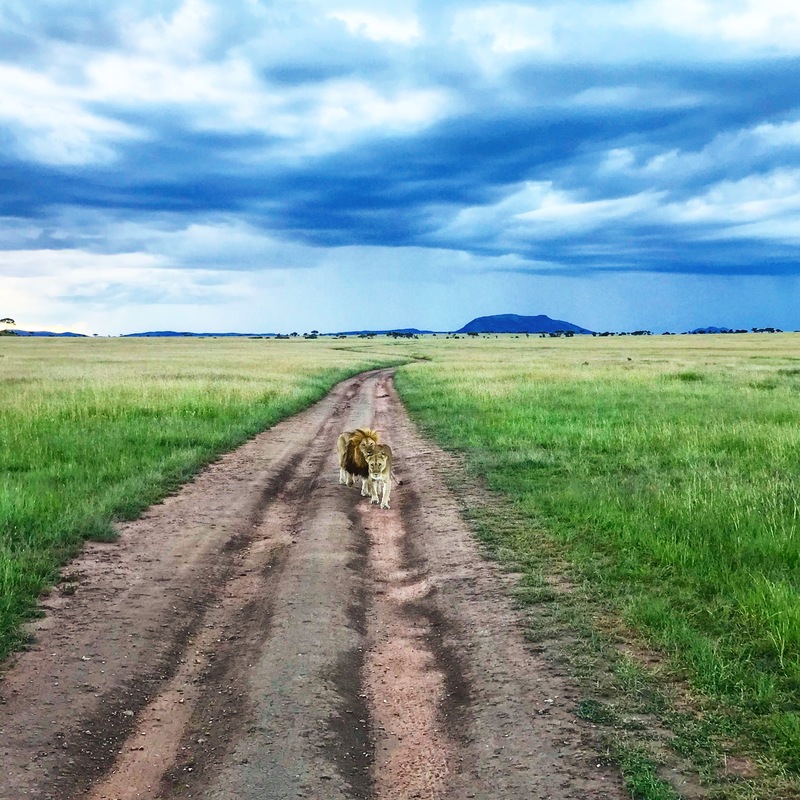 Options: Nyumbani Tented Camp, Kati Kati Tented Camp, Serengeti Under Canvas, Serengeti Sopa Lodge, Serengeti Four Seasons Lodge, or adventure camping. Start your 5-days Tanzania safari, depart Arusha after breakfast. You will reach Tarangire National Park around 10-11am. Start game drive in the late morning inside the park. Here you will get a chance to see the beautiful herds of African elephants against the spectacular background of savannah filled with magnificent baobab trees. These trees are exquisitely bare during the dry season and lush green in the wet season. The splendid beauty of the scenic nature and diversity in Tarangire National Park are mainly supported by Tarangire River. This river offers water throughout the year. To maximize your time on game drive we provide packed lunch box at the picnic site before going for an afternoon game drive. After having breakfast, drive to southern or central Serengeti National Park. This drive will take around 3-4 hours. On the way, you will enjoy the awe-inspiring scenery as you river up to the Ngorongoro highlands. You also hate ve option to stop at Olduvai Gorge Museum – home to early hominids. You will start the game drive in the endless savannah of Serengeti National Park. Immense yourself into wildlife observation in the middle of vast Serengeti plains. Enjoy your lunch at the picnic site and drive to the central Serengeti National Park. Late evening game drive will offer you an amazing experience as you observe a multitude of wild animals roaming in the open savannah. Lay back relax and enjoy the magnificence of the African sunset. On this 5-day Tanzania safari, you will spend a full day in Serengeti National Park – Tanzania’s second largest national park. The park covers around 6,000 square miles of Savannah, grassland plains, woodlands, hills, and riverine forests. During the full day tof5-days Tanzania safari, you will discover the endless plains, Central Circuits, Kopjes that covers an appealing variety of unique Big Cats roaming throughout the area. Serengeti National Park is the home to the annual wildebeest migration. Here you will have a great opportunity to explore about 2.5 million wildebeest and huge herds of gazelles as well as zebras. Enjoy a picnic lunch or return to your lodge for hot lunch and rest before embarking on an evening a game drive. Indulge in breathtaking sunset or sit around d campfire listening to wilderness sound while sipping a glass of wine or tea. You can add a hot air balloon in the morning or evening into this wildlife safari. Drive to Ngorongoro Crater. Upon reaching the Ngorongoro Crater area, you will be mesmerized in the largest unbroken caldera. It’s the home to a huge variety of animal species occupying the diverse space of the caldera. Spend a full day in the Ngorongoro Conservation Area – a natural habitat rich in a vibrant culture and teeming with wildlife species. Get to see around 30,000 animals in and around the crater area, including black rhino, cheetah, hyena, eland, lion, and several antelope species. This space is generally shared by Masai and their cattle people known as “The Garden of Eden”. Enjoy breakfast before starting the drive to Arusha with a stopover at Rift Valley view point and Mto Wa Mbu for local lunch. Depend on your onward plans or if you combine this safari with Zanzibar. Your driver will drop you off at the airport for departure which makes the end of 5-days Tanzania safari.